This morning the board of (s)elections met to disqualify my petitions as insufficient. To be honest, they met twice, since they had to reconvene when they realized they never voted to disqualify them. They also started 5 minutes late- having to wait for Chairperson Rhine McLin to show up. They were kind enough to let me speak. I let them have it. The petitions are faulty, have been faulty and will continue to be faulty thanks to a City Commission that likes them that way. The BOE does the dirty work for the political parties who appoint them, yet refuses to tell the City of Dayton that their forms are non-compliant in so many ways. Like saying “name” instead of signature, like having columns for “ward” and “precinct” even though they are unnecessary. The list goes on. Add in that there doesn’t exist an ADA compliant petition online, and you have the gist of what I said, along with that I was calling them out for ignoring the will of the people. This only puts me on the ballot- where voters decide, unlike them, who are put on the board by the parties- which don’t hold legal meetings (taking attendance of elected precinct captains would be a good start). Did I mention the Dem’s endorsed candidates 2 months ago- before all the petitions had been approved. I pointed out that printed signatures can be remedied by protest/contest of their findings- as in Miami County. The board was advised by their legal counsel that I was entitled to a protest, and it is legal to question their findings. Then they adjourned, and had to reconvene, because they forgot to vote me off the island. On the way to the offices- to request copies of my petitions with their contested signatures an employee of the board thought he had the right to give me a lecture on how I screwed up- and failed to teach my petition circulators how to do it. That isn’t his job, and if I have my way, he won’t have a job at the end of today. I’ve uploaded the form I sent out with my circulators- where I gave very specific instructions. When I got to the BOE offices I submitted my requests. I also got copies of the 29 petitions with their markings for validity. The standard is that one dem and one dem checks each signature- and checks it off. If they both don’t think it makes it- they are to put a specific code on the left margin. This is to be done in red ink. We went through the petitions and built a spreadsheet of the people who failed- and why. The only problem is that the BOE, which is such a stickler for following the law, created their own codes for disqualifying signatures. Naughty naughty. DUP “Duplicate signature.” The person has signed more than one part-petition or twice on the same part-petition. 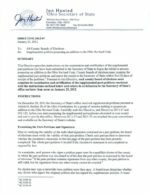 ILL “Illegible” applies only if both the signature and address are unreadable, such that it is impossible for board personnel to query the board’s voter registration system to check the signature against a voter registration record. NA “No address.” The signer’s complete address must be provided: house number and street name or RFO, and the appropriate city, village, or township. 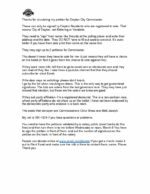 Ward and precinct information is not required. NG “Not Genuine.” The signature on the petition does not appear to be the genuine signature of the person whose signature it purports to be when compared to the signature on file with the board of elections as of the date the board checks the petition. NR “Not Registered.” The signer is not registered to vote. Each person who signs a petition paper must be a qualified elector as of the date the board examines the petition. NRA “Not Registered Address.” The address provided on the petition paper is not the address on file with the board of elections as of the date the board examines the petition. OC “Other County.” The signer is a resident of some other county. Do not cross out signature or address; instead. place code at left margin. P “Pencil.” The signature was written using a pencil. 11 disqualified for “JUR,” 8 disqualified for “SIG,” 3 disqualified for “N/R” or “NIR,” none of which are valid codes. They told me 28 were disqualified for printed name. 2 the address was missing (probably because they filled out signed name in the name field and the signature in the address field- very easy to determine the voter, because the addresses were going from the walking list- one had the apartment number). 19 were not qualified – meaning not registered (this is possible when you walk up to a house using a voter walking list generated based on only 1 election- since their site doesn’t allow you to multiple select elections the way they let you pick party when generating lists). 14 were marked for jurisdiction, which meant they didn’t live in Dayton. This would be OC- not JUR. 3 were duplicate signers- OK.
1 address did not agree. 7 duplicates other petitions- they had signed two other petitions and couldn’t sign more. However, the idea that 74 voters are liars, or the circulator committed fraud is too high. That’s over 10%. The form design is bad. That’s why back in 2011 I redesigned the form- and it still hasn’t been updated. At some point, a real BOE, would have told the City to create a document that works better than this. But they don’t. So they look stupid. We’ll get to collect affidavits from at least 11 voters who were disqualified for printing their name- instead of signing, to put me on the ballot. The only question is when the hearing will be and what format the affidavit has to take. See yesterdays post about Jose Lopez challenged printed names in Miami County. The Dayton Daily had a bunch of mistakes- but they did get one thing right- I’m going to fight. Turner-Sloss’ name was not included in a Tuesday Dayton Daily News article about the commission race because incorrect information was shared by the elections office. He said some people who signed his petitions signed their names instead of printing them. (correction- they printed their names not signed them) Esrati said he plans to get affidavits from about a dozen people proving they supported his petition or he’ll ask them to show up to the protest meeting to verify their support. Esrati said the petition forms and process are deeply flawed and need to be fixed. He said the process deliberately tries to make it hard for people to get on the ballot. He promised to put petition reforms on the ballot if elected to the city commission. “It’s not the Board of Selections — it’s the Board of Elections, and they are trying their damnedest to stop having elections at any cost,” he said. Next Post: Go to jail, win the lottery. This is the type of accountability the BOE needs to uphold. It should be alarming to all of us that the alleged disqualifications were based on such questionable criteria. Feel like you should be able to disqualify their disqualifications for not properly labeling their verifications. We take attendance at Central and Executive Committee meetings, David. Kurt Hatcher- you may take attendance but you are refusing to post it. I’ve got it on video when Mike Bock called for it to be published and the Central Committee voted it down. You are part of the problem Kurt. Sorry. David – over time, i’ve debated and disagreed with you. Here I am to say, on this case, you’ve got a real beef – and, it’s kind of a beef, well, jerky. 2 years ago, i too picked up petitions at the BOE – fact is, no worthwhile candidates will avail themselves of candidacy anymore because of the smack down by the 24/7 news and social news cycle. No way should the process to place your name be complicated by having to go to the BOE page and work around canvassing signatures as reg. voters and, etc. because they’ve moved, died or lied. Gee Whiz, show your license, prove you live in the damned jurisdiction and sign an affadavit that you will act right, do the hokey-pokey and fall in line with the hoochy-koochie confab that has been designated to call the shots. David, sometimes you get out of your lane; however, in this case, you’re in the right lane – just stay the course. The paper got parts of the story wrong again- but, at least they got Shenise in the race now. And Bob- I plan on making the same argument in the protest. You claimed we do not take attendance. When I point out that you were incorrect, you moved the goal posts. Now it seems you’re not concerned with *taking* the attendance, it’s the *posting*. And your point about Mr. Bock’s motion is irrelevant. He made a motion, and it was voted down. No one is claiming that didn’t happen, so the video evidence is…damning I guess? Definitely not some puzzle piece in a grand conspiracy. I know my posts will not change your opinion one bit. Truly hope you find peace.